First, high competition: Financial institutes adopt technology, which has accelerated development of the global financial industry. Especially in China, the competition in the financial industry is becoming increasingly hot. How to reduce the operating costs, increase benefit per capita, and maximize the benefit has become a key point for all these players. Secondly, slashing operating costs: Among general operating expenses, communication cost between among branches accounts for a large proportion of operating costs. In particular, some financial companies with global offices are under great pressure on communication spending and security. Thirdly, safety and efficiency are equally important: On the one hand, financial institutions are actively seeking new ways to optimize communications between companies and customers and hoping new coordination channels will be available for customers via the new communication systems. At the same time, they want to improve the communication efficiency and attract and retain high-value customers, with consideration over communication security and efficiency. To address these above problems encountered by the financial industry in building communication systems, Synway provides multiple-branched institutes with an all-in-one solution, by converging its VoIP gateway, Session Border Controller, and IP-PBX . 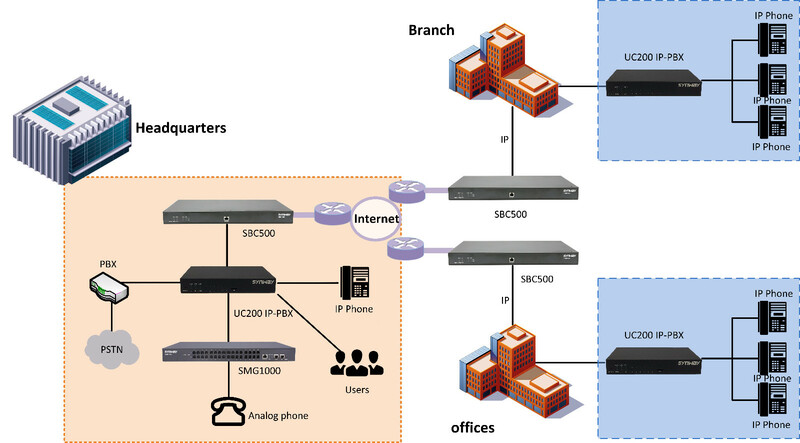 Through combination of SMG gateway, SBC, UC200 IP-PBX, the legacy PSTN equipment can connect to versatile and cost-effective VoIP network smoothly. By so doing, financial institutes could make full use of existing resources, and expand the access of VOIP applications without affecting the daily business and eradicating its existing network. It can significantly reduce corporate communication costs and reduce business operating costs. The system has high security and expandability, and is suitable for changeable communication needs for future. Synway SMG1000 series analog gateway can connect all PSTN legacy phones to IP networks, and convert TDM call to IP call or reversely. It also supports a range of functions such as caller ID, number change, call transfer/waiting, automatic dialing, and do-not-disturb setting. The UC200 can implement up to 300 registered SIP extensions and can be expanded to 500 users if needed, and the maximum number of concurrent calls is 60 calls, which can maximize communication efficiency. UC200 can work even if IP-network is not accessible, and possess a range of standard and enhanced features including multi-level IVR, voice navigation, conference call, call center, Queue, CDR, recording monitoring, broadcast intercom and other functions which can effectively improve communication efficiency at work. Synway's SBC supports Dos/DDos protection, QOS/TOS/DSCP settings, signaling encryption (TLS) and media encryption (SRTP). NAT transverse can also be achieved, while supporting IPV4, IPV6 and VPN. It also has load balancing/traffic handling/dataflow control, RTP encoding format conversion, phone theft prevention, and multi-machine redundancy, all of which plays a role in security protection of the entire system. With Synway's products in the entire communication system, financial institutes could empower its branch offices worldwide to access to versatile, secure and efficient communication systems.